The Settler’s Chair by Jon Goulder, Australia’s highly acclaimed 4th generation furniture maker and master craftsman, will be exhibited alongside several bespoke pieces made from Tasmanian Blackwood at the upcoming Milan Design Week 2017. Britton Timbers has been working in close collaboration with Jon Goulder to create several bespoke pieces in Tasmanian Blackwood for the prestigious international design event. 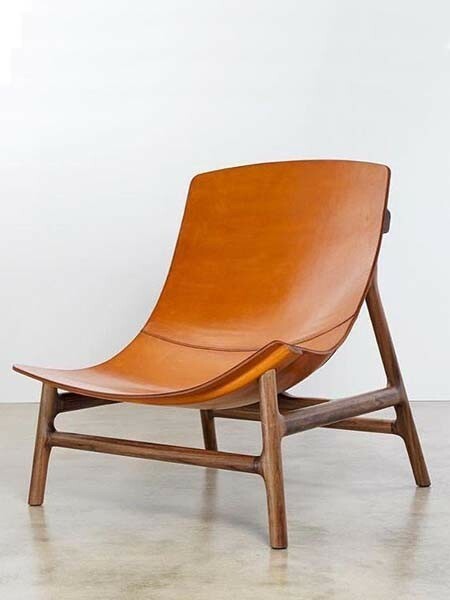 Goulder’s iconic Settler’s Chair was one of 33 chairs recently selected by the National Gallery of Victoria to be exhibited as part of the ‘Creating the Contemporary Chair’ exhibition. It will now make an appearance at the ‘Local Milan’ exhibit, curated by Local Design’s Emma Elizabeth and featuring 11 Australian designers. Inspired by early Australian Colonial furniture, especially the natural materials available at the time, the chair features a frame made from Old Growth Blackwood from Tasmania’s forests. The water formed leather, sourced from Australia and crafted to feel and wear like an old saddle, was created using a unique process developed by Goulder specifically for this piece. The Local Milan exhibit also features a series of congruent side tables, a collaborative work from Adelaide’s Jam Factory between Goulder and glass artist Liam Fleming. The tables are hand blown glass with turned Tasmanian Blackwood tops.